Imagine you are out walking in the woods in the winter. The air is clean and crisp, there are only your footprints in the snow and silence really is golden. 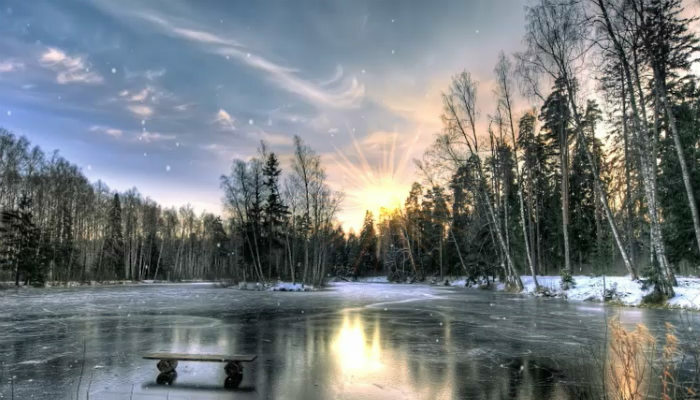 This frozen lake is what we all want to chance upon while walking at Christmas time, but in reality is something few of us will experience. The pink sky is perfectly reflected in the frozen water, and when you click on preview you can see the clarity of the detail is quite superb. This isn't your traditional Christmas scene but perfectly captures the natural beauty of winter. When it is on an ecard, as this one is, it is becomes quite splendid e Christmas cards for business. Most of us in business have some dealings with US companies, and sending them this ecard via email will really make their day. Thanksgiving is more important than Christmas to many Americans and you can make a great impression by sending these business holiday ecards to them on this most special of holidays. You can add music, you can add a personal message, and you want to be adding that logo to be remembered as the thoughtful company. You could also send it an as alternative holiday ecard, and it will be more appreciated than yet another sleigh.